My home state of Wisconsin has been at the top of the news recently as Democrats and Republicans have hunkered down to wage battle over Gov. 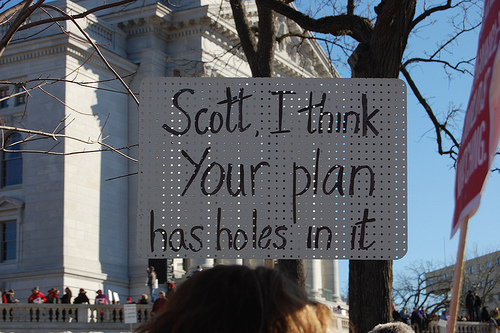 Scott Walker’s budget repair bill. At the heart of the squabble is the insistence on Walker’s part to eliminate most of the collective bargaining rights currently belonging to the state’s unions. While a discussion of what rights should belong to labor unions is another article for another day, one of the reasons behind this budget bill’s push through state Congress is very much in the forefront. Gov. Walker believes that one of the big albatrosses in the current state budget is public employees’ health care and pension liability costs. He’s asking that public employees share in some of the cost of their own health care coverage and pension benefits. While unions have for the most part agreed to these concessions, the disagreement over collective bargaining rights remains the sticking point. Most people nowadays are no longer covered by company pension plans but there are still a lucky few out there who are. Those lucky few reside primarily in the public sector where the general opinion is that workers accept lower pay but receive better benefits. Wisconsin by all regards has one of the better funded pension plans out there but that’s certainly not the case for all states. The quality and viability of pension plans often lie with the plan managers who take into account the age, compensation history and service history of employees in order to estimate how much will be needed in order to provide promised benefits to retirees. One of the big problems running into public pension plans now is the inflexibility of the plans themselves. In the private sector, companies can often change how the plan operates to manage costs in order to reflect current conditions. In the public sector, pension plans can be limited by state law that can guarantee the continued funding rate of plans even if the entity wishes to modify it. The result is that pension plans are becoming richer and richer for plan benefactors and more costly for states. The other factor working against pension plans is the recent performance of the stock market. Pensions regularly use the stock market to grow the plan’s asset base. As the market has struggled over the past decade, an expected source of plan funding has come up short of expectations and as a result has left pension plans struggling to maintain their funded status. So you can start to see why pension liability has become a target for budget cuts. As mentioned, unions have agreed to begin sharing in the costs of pension plan funding but a final resolution to the whole picture could still be a ways off. It’s expected that this legislation will eventually pass and could very well be followed by other states passing similar bills. But it’s also become clear that whether it’s concerning health care costs or retirement benefit costs, employees in all sectors better get used to the idea of contributing a larger share. However certainly in most states unions are already paying into their pension. In fact the real problem is that the workers have been paying their share, but the states have been kicking the can down the road, not paying THEIR SHARE, and now that the unthinkable happened (the market didn’t go up indefinitely) states have decided they won’t meet their obligations. In my mind pensions/salary are interchangeable. Pay me enough extra money and I don’t need a pension. Of course the pension is a better choice for most people since they would make irresponsible choices. Broke people are no good for anybody in our society, so pensions just make sense. As with most things in life, the problem is a lack of understanding. Today I was shocked when two fellow teachers were expressing their hatred with unions and the wish that they would be abolished. If two older teachers could be ignorant to the historical value that unions present then what hope is there for others? Surely the irony can’t be lost that the push to eliminate pensions happens at a time when the market has had a recent decline… the ultimate sign of why pensions are such a good tool and workers can’t be trusted to completely manage their own retirement. Pensions and collective bargaining are separate issues though…Wisconsin is all about the rich stealing from the middle class, and of course nobody caring about the poor.